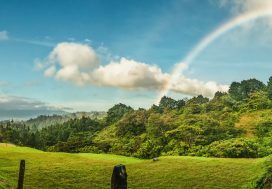 Costa Rica has long been hailed internationally as a vacation paradise for surfers, extreme hikers, and jungle adventurers, but those who venture down to this tropical country are quite a bit more diverse than that. During any month of the year you can find families looking for some quiet beach time, couples enjoying luxury spas and high-class resorts, and backpacking musicians, looking to pick up some Caribbean inspiration. A new demographic of vacationers, however, has begun to show up on the radar. Equestrians are now choosing Costa Rica as their number 1 riding retreat destination. 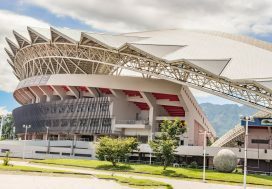 With so much incredible nature to explore, Costa Rica has developed a very strong tourism industry. As that industry grew, horseback tours became part of the equation. Now, you can find a horseback tour in almost any part of the country, exploring any local geography. On top of that, you can find equestrian farms willing to rent well-cared-for horses for longer expeditions. Regardless of your experience around horses or riding ability level, there’s a trip that’s right up your alley. Add a horseback tour to your next trip’s itinerary, or better yet, develop an entire itinerary dedicated to the Equestrian arts in Costa Rica. 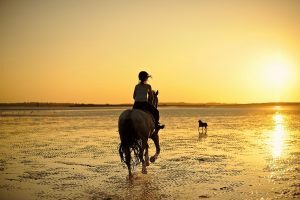 Experienced riders will be less interested in horseback tours, with horses conditioned to take a certain trail at a certain speed, and will want to set out on a more organic riding adventure. If you’re looking to find a horse perfectly suited to your experience and riding style, your first stop should be Centaura Farm. At Centaura Farm, the horses are selected from top-quality genetic lines, then given state-of-the-art care for their entire lives. These horses are so skilled at working with different riders that visitors to the farm have reported that the horses can understand what they want before any orders are even given. This may be why CNN listed the locale as one of the top horse riding destinations in the entire world. Stop by the farm with your entire travel group. Each person will be matched with a horse depending on height, statue, riding style, and experience levels. You’ll have your choice of different trails, fields, or rings to ride in. Regardless of whether you decide to stay in the on-campus field or venture into the rain forest, you’ll have the time of your life and will, more likely than not, be surprised at the bond you form with your horse in just a few hours. You may not be a big horse buff, but any vacationer will jump at the chance of a Caribbean beach ride. Alone or with your romantic partner, riding a horse on the beach through the Caribbean sunset is an opportunity you won’t want to miss. 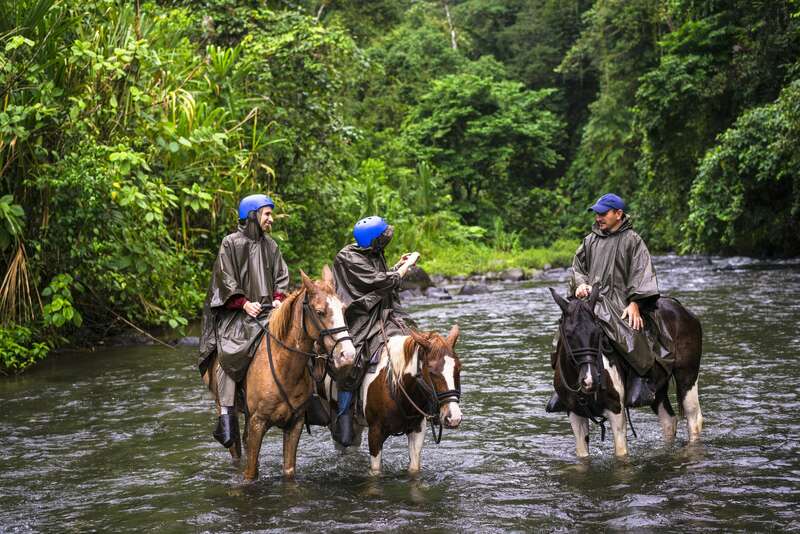 Sign up for this picturesque ride at Caribe Horse Riding Club in Puerto Viejo. The typical beach ride with be about an hour and a half long, traveling through white sand beaches and swaying palm trees. You’ll meet with a very knowledgeable guide who can help you brush up on your horse riding skills before you set off. You’ll have your pick of spirited, excited young horses and more stable, experienced older horses, and your guide will help you find the perfect match. If you arrive early enough in the day, request to be led through the rainforest for the first part of your trip. You’ll see some tropical plants and exotic animals and still make it to the beach in time for your sunset ride. This picture-perfect option is set on the Caribbean coast, but there are plenty of beach rides available on the Pacific side of the country as well. Look into reputable horse tour agencies and inquire about a sunset ride. Even if you don’t plan on making in to the Caribbean coast on this trip, you won’t want to miss a beach ride opportunity. Many riders like to take on longer trails through the windy fields of Costa Rica, taking advantage of the scenery and concentrating on the horse-rider bond. Others however, prefer a little more action. If you were hoping to climb a volcano or two during your Costa Rican adventure, you can do so with the help of a horse. Combine the best of both worlds and include a horseback ride in with your extreme adventure day. Head to Arenal Mundo Aventura, a tour operator working below the Arenal Volcano. Their experienced horses know how to navigate difficult trails, and they’re even used to working with inexperienced riders. You can bond with your horse at the base of the volcano and take a slow and steady ride up. The horse does most of the work, leaving you to enjoy the scenery and watch out for tropical birds. You’ll ride through a tropical rain forest during the trek up, but Arenal Mundo Aventura takes it one step further. In their offices, you’ll be able to hand-select the perfect package for you. This horse ride will take on dimensions you’ve never imagined. Add a zip-lining tour to the ride itinerary. Ask for a horse trail that will take you straight to the waterfall viewpoint. Ask to view the hanging bridge. You’ll be able to ride your horse between activities and fit everything in for an afternoon you’ll never forget. A horseback ride isn’t only a great way to spend time with animals while you’re on vacation, it’s also a great way to see the scenery. Costa Rica is a small country, but it has 12 microclimates and nearly 5% of the world’s entire biodiversity. With so much to see, there’s no way you can cover it all on foot. Get the most out of your vacation by exploring a little bit quicker, from atop a horse. For the ideal scenic ride, head to Good Costa Rica tour agency. This farm will give you not only your choice of horses, but your choice of scenery as well. With any package, you can see beaches, jungles, private reserves, and volcano viewpoints. Your horse will take you through multiple running water streams in order to get the best possible views of nearby waterfalls. Your ride will be long, eventful, and the picture-perfect experience you’ll write back home about. Many horse tour farms in Costa Rica have horses trained for adventure and difficult trains, but Leaves & Lizards Resort beats them all. 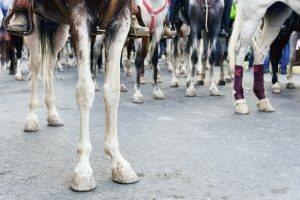 Here, the well-trained horses are used to difficult trails, and they know how to safely keep their footing and pace. In just 2 hours, you’ll spend time in the dense rain forest, trot through a breezy field, a stand below a waterfall. You’ll see more of Costa Rica than you could ever manage on foot, and will fully enjoy your time in the wild. Don’t let your inexperience with horses scare you away either, the guides back at the ranch will make sure you’re fully equip to handle your stallion, and the horses will be much more accustomed to the trails than you are. Spend your vacation among local horses in their adventurous habitat, you’re sure to have the trip of a lifetime.